Developers & Chains deals in business opportunities, not opportunities that you've missed out on. We specialize in futures, not histories. 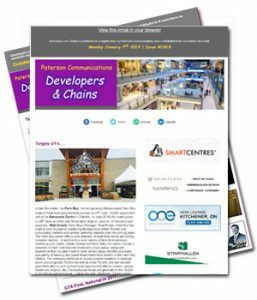 Developers & Chains is a subscription-only publication that focuses on retail and restaurant expansion across Canada. Developers & Chains is a subscription-only publication that concentrates on the growth and expansion aspects of the retail and restaurant industry across Canada, from British Columbia to Newfoundland. Each issue, and there are over 100 each year, includes information on new concepts and existing chains that have stated an interest in expansion and/or are showing signs of growth. And the reports include details on the companies, their needs and requirement along with the appropriate contacts. Developers & Chains issues also identify new shopping projects, malls and centres that are renovating, expanding or that simply have prime spaces that our subscribers may have available. Again, the issues include the leasing contacts, the uses they are seeking and where to contact them. There is more too. The publication keeps the subscribers aware of planned industry events and changes within the business. There are frequent reports on both retail and development sales and acquisitions, what companies are retaining which real estate-related suppliers and much, much more. Developers & Chains provides the type of leads and information that everyone in the business needs to make calculated decisions and it is all presented in a clear, factual, concise and timely manner that you can depend on. More important though, much of the leasing leads and company details are exclusive to the Developers & Chains’ E-News. They are available only in this publication. The information is exclusive in that it comes directly from our personal conversations with the principals or representatives of the featured companies. It’s almost as if you are there, sitting in on the conversation. Take a look through a recent issues of the Developers & Chains’ E-News. You will find details on new concepts seeking their first location and national chains looking for dozens of new units. You will learn, first hand, about planned entries into new markets. Whether it is a 150 square foot kiosk or a 30,000 square foot anchor tenant for your property, this is where you will meet them first. You will read about malls, centres and large format projects that have that ideal space, perfect for your next store. And you will ‘meet’ the people and companies involved. Oh yes, and the ‘editorial’ that ends every issue. Don’t take offence. It is just a tongue-in-cheek, maybe even irreverent, look at the business that we sometimes take a little too seriously.